In 2003 the staff from Adams Spanish Immersion Magnet School was invited to participate in the Saint Paul Public School’s Project for Academic Excellence. One of the main elements of the project is the Literacy Initiative, which includes a daily one-hour Writer’s Workshop integrating reading and writing. During the workshop time, students adopt the life of a writer. They write every day, generating their own ideas and working through the writing process (draft, revise, edit, and publish). They are exposed to different genre studies and authors. They learn about the techniques authors use to draw readers in, to sustain their interest and ensure their understanding, to create tension, and to bring writing to a close. They analyze texts, thus learning how to vary sentence structure, embed essential details, or organize an argument. They use authentic literature as a model for their own writing. And, finally, they publish at least ten polished pieces of writing each year. How do I implement these ideas in an immersion setting? How can I write stories with children who are beginning to acquire vocabulary in a second language? What is the best sequence for developing this process? When am I going to teach the mechanics of writing? How can I find authentic books in Spanish that are good examples of different genres? How will I find the money to obtain the books? How much time is this going to take? •What if I spend all the time required and don’t see results? What about students who can’t write yet? How can I include an hour lesson in a traditional Language Arts block? How am I going to organize reading time in the schedule? What do they mean by “Students work to polish at least ten original pieces of writing each year?” Who determines when the piece of writing is ready to publish? Do they want perfect work? Do I have to type the stories and correct all the mistakes before placing the writing on the walls? Is that real student work? In my initial attempts to implement ideas from the training, I felt insecure and alone since no other first grade teacher in my building had attended the professional development institute. My students were sharing ideas in English most of the time or were relying on theme-based prompts from our social studies or science units to write simple pattern sentences. They were not developing their own ideas — one of the goals of the Writer’s Workshop. Nevertheless, with further training and a chance to observe classrooms where the Writer’s Workshop was being used effectively, I began to incorporate the recommended sequence of study: the “writerly life”, personal narrative, literary non-fiction, and poetry. Reading authentic Spanish literature helped us develop ideas for our writing, and we spent time sharing those ideas orally. When it was time to write, the process went more smoothly. I finished the last phase of the professional development institute and began the second year of implementation by assigning a physical space for meetings, for writing materials, and for the display of our work and by establishing a specific time for the daily workshop (see Figures 1 and 2, p. 7). The consistency of the routines and the stability of the physical spaces provided the kind of scaffolding that helps students focus on learning and, in an immersion classroom, on second language acquisition (Peregoy & Boyle, 2005). Although most of the sharing during the first unit was in English, little by little students started using words from the books I had chosen to guide our conversations and develop new vocabulary. I also took advantage of the books to work on comprehension skills and to show my students cultural differences when the books lent themselves to such comparison. Following my modeling, students shared their stories with peers. They gradually built up and used their Spanish, a key aspect to developing oral language proficiency in the second language (Cloud, Genesee & Hamayan, 2000). My first grade students needed a lot of encouragement in their initial attempts to write. However, they were so completely involved in the process they overcame their fears. Students started using the vocabulary I had introduced during writing time (escritor, escritora [writer], reunión [meeting], lección [lesson], ideas [ideas], ¿Quieres compartir conmigo? [Do you want to share with me? ], Me gusta tu historia. [I like your story. ], etc.). They learned the routines and the language that goes with them. As a result, their second language development was being supported (Peregoy & Boyle, 2005). Students began to collect entries in their writing folders. Their ideas came from the books we read, from classroom experiences (field trips, projects, presentations), and from their personal lives (weekend activities, birthday parties, visits to relatives). They wrote classroom books to reinforce the idea of themselves as writers. These were the most requested books from our classroom library during independent reading time. Each student brought in a memory box to establish his/her “writerly life.” Serving as a connection between school and home, parents and children enthusiastically created the memory boxes choosing special objects that reflected important moments in each student’s life. After sharing the stories that came with each object we started to write following the steps of the writing process. It was a powerful experience for my students because they were free to choose their own topics (Peregoy & Boyle, 2005) and they were taking responsibility for their own learning. After working on their pieces for several days, we created a checklist to assess our final products. Using the checklist students were able to examine their own writing to ensure that they had all the elements of a finished piece. Current studies confirm the similarity of the writing process for both first and second language writers: “… The problems writers face are either specific to the conventions of writing English, such as spelling, grammar, and rhetorical choice, or they relate with more general aspects of the writing process, such as choosing a topic, deciding what to say, and tailoring the message to the intended audience— elements that go into writing in any language” (Peregoy & Boyle, 2005, p.208). Although the writing process is similar for both first and second language writers, there are important differences. Second language writers have a more limited ability to express original ideas since they do not possess the depth or breadth of vocabulary, the understanding of idiomatic expressions, or the ear for correct grammar usage that native speakers do. Nor do they have much exposure to writing in the target language. For this reason it is crucial to give students many different opportunities to write in order to improve their writing and promote second language acquisition (Peregoy & Boyle, 2005). The Writer’s Workshop, an example of the process approach to writing, places the learner at the center of the learning process and considers that children learn to write most successfully when they are encouraged to start with their own expressive language. This approach affirms research findings: writing should take place frequently and within a context that provides real audiences for writing (Gibbons, 2002). After completing the professional development institutes and implementing the Writer’s Workshop in my first grade immersion classroom, I have found some answers to the questions I inititally posed. They appear below. How do I implement these ideas in an immersion setting? The Writer�s Workshop is related to the process approach to teaching writing that has been used successfully in second language classrooms. Establishing the rules and routines for the workshop are important in creating a solid base upon which to build future learning experiences. How should I write stories with children who are beginning to acquire vocabulary in a second language? Students start the year sharing stories orally using their first language but increase the use of the immersion language after acquiring vocabulary from books and class routines. Teacher modeling of the immersion language helps students develop their language skills. The Writer�s Workshop scaffolds a complex process by breaking it down into smaller steps (pre-writing, drafting, revising, editing, and publishing). From the beginning students develop vocabulary and writing ideas from exposure to authentic literature. When am I going to teach the mechanics of writing? At first writing time is shared with skill-development time; later, the whole hour is dedicated to the writing process. How can I find authentic books in Spanish that are good examples of different genres? How will I find the money to obtain the books? One of the best ways to find appropriate books is to go through personal collections identifying books that are examples of each genre. Share ideas with colleagues, ask for their advice and expertise, analyze books together. Tell parents about the Writer�s Workshop, propose a list of books and ask for donations of books or money to buy books. How much time is this going to take? What if I spend all the time required and don�t see results? 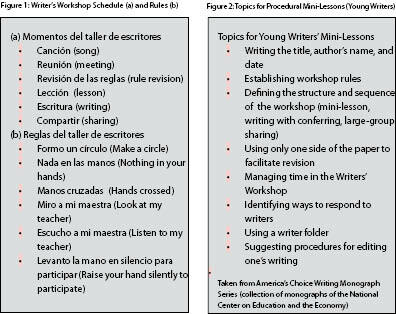 The implementation of the Writer�s Workshop in an immersion classroom will take more time and effort than in a monolingual classroom, but the benefits are numerous: Students take ownership of their own writing; they understand the process and can concentrate on each phase; their second language skills increase daily with exposure to authentic literature and class routines. What about the students who can�t write yet? Oral language development is an important pre-writing stage that is achieved by reading and discussing different genres of literature, talking about personal experiences inside and outside the classroom and managing class routines. Schedule the Writer�s Workshop when an assistant may be available to help with struggling writers. How can I include an hour lesson in a traditional Language Arts block? How am I going to organize reading time into the schedule? Since the Writer�s Workshop is built on an interaction between reading and writing, the Language Arts block encompasses both. Reading authentic literature immerses students in the study of genres and promotes the development of oral language proficiency. Strategies and skills learned during both writing and reading can be integrated and used with other subject areas like science and social studies. Who determines when the piece of writing is ready to publish? Do I have to type the stories and correct all of the mistakes before placing the writing on the walls? Is that real student work? Students, with direction from the teacher, develop rubrics or checklists to assess their own and peers� writing. Self and peer editing is part of the writing process.